We have a whole lot of pictures of the dancing at our wedding picnic, so I thought this would be a perfect opportunity to scrap some of those. 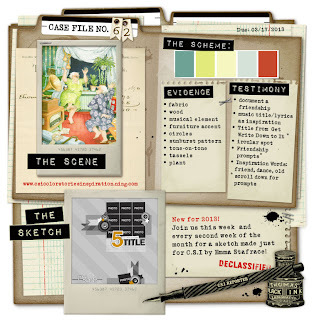 It being the second week of the month, the Case File includes a fabulous sketch from Emma Stafrace and this one uses NINE small photos - IDEAL! 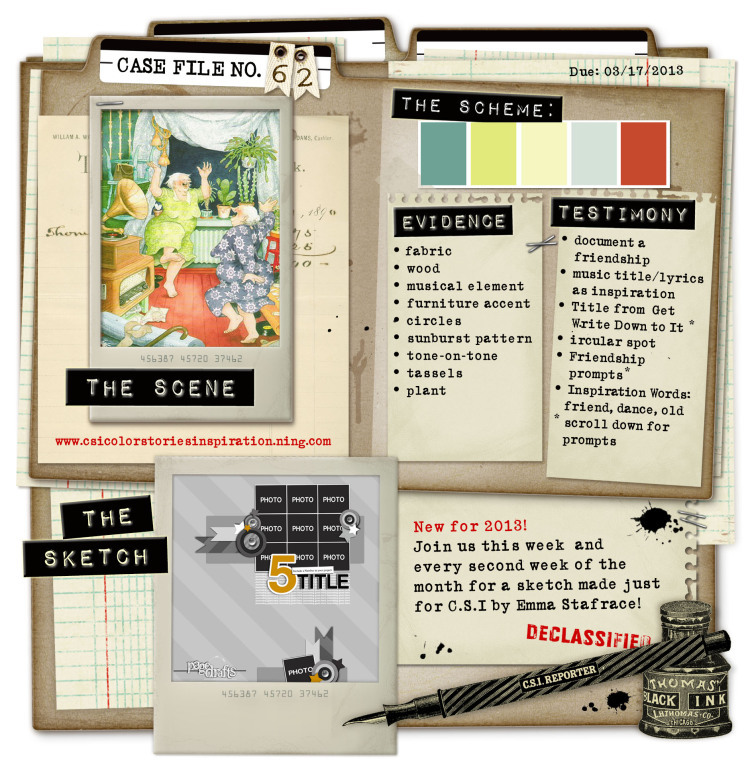 To help you solve the Case, there is a new set of CSI Coordinates each week, designed by the talented Michele Singh - these are free printables which you can download to your pc and they are BRILLIANT! The Testimony: Inspired by the words "dance" and "friend"
I enjoyed doodling around the ink splats and masked areas. The photos are mounted on the pale greenish yellow colour and cut with a very narrow margin, just to "lift and separate" a bit! I cut out the separate "planks" from the Coordinations , distressed and inked the edges and adhered them in a slightly wonky way to give a more lively, quirky feel to the page. and the centre hole punched with the crop-o-dile. Lots of washi tape agin on theis page as you can see! Well that's it for today, it's well gone midnight and I have to get up for work in six hours - where does the time go? !